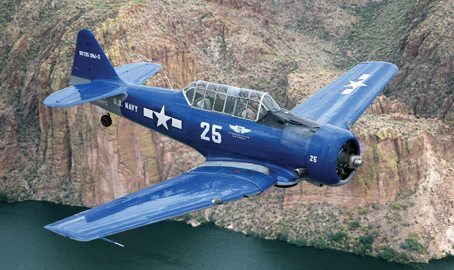 The SNJ-T6 Texan established a unique racing class at the Reno National Air Races and is a regular participant at air shows. It’s made many movie appearances including Tora, Tora, Tora; A Bridge Too Far, and many more. Accessibility: Must be able to climb onto wing and into cockpit. Total passenger and pilot weight not to exceed 450 lbs. Passenger must be able to climb onto wing and into cockpit without assistance. Passenger weight not to exceed 280 lbs.